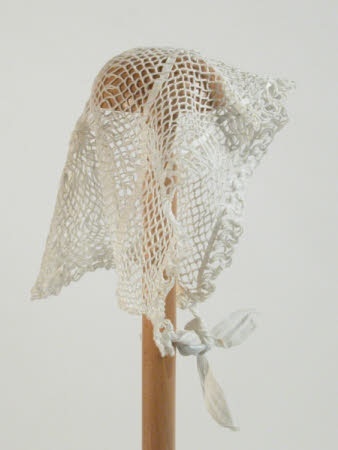 Remember how I said I was going to crochet some hairnets to find the right design for Eleanor's caul? Well I have been crocheting snoods, varying the sizes, getting distracted by extant boudoir caps, making beanies because it's cold, had a few 'that's not right' moments and I've learnt a lot. left and top left: blonde snoods - when I choose the yarns for these 2 they looked nearly identical inside their plastic wrap, the results couldn't be more different. the browns from top to bottom: brunette snoods in plain, pearl beads and gold thread - although the same brown yarn was used for all 3 of them, the addition of pearl beads and gold thread really makes a difference to the look and feel. 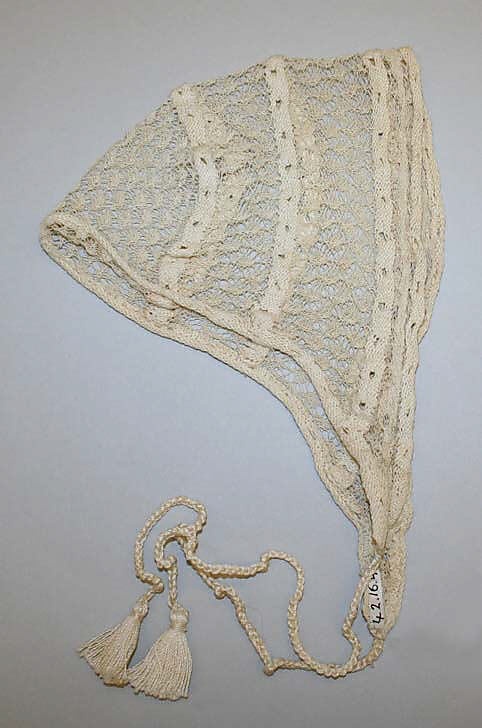 bottom: Juliet caps in fine white crochet cotton, the large one on the left has gold thread incorporated and worked the best, next to that is an attempt at a smaller mesh with silver thread and below that a plain cotton with pearl beads but without the metallic thread it doesn't hold it's shape as well as the others. top right: a hair bun net that I turned into a small reticule, not quite finished until the ends are stitched in and drawstring added. far right: My early Victorian cap interpretation, I made the pattern up as I went inspired by extant examples. Also not quite finished. Yes her head is on backwards - thank you for noticing. Some attempts worked better then others, this thingo was supposed to be a boudoir cap. I haven't undone yet because it was soo much work and I haven't decided if I should turn it into a giant flower or something. What would you do with it? I also made hubby a beanie. But deviations aside, I've almost got the mesh design for my interpretation of Eleanor's caul. I bet that these would be very popular in school. Girls like different and this would be different. I love the one with the backward head. lol.